Another GREAT Trump rally in Las Vegas NV had crowds roaring more standing outside. The RED Wave is coming in November! Trump did not mention Christine Blasey Ford, who has accused Kavanaugh of sexually assaulting her at a party when they were in high school more than three decades ago. President Trump focused his remarks on supporting Kavanaugh and said, I think everything will be just fine. I’m not saying anything about anybody else, but I want to tell you Brett Kavanaugh is one of the finest human beings you ever have the privilege of knowing or meeting. We’ll have to let it play out, but I want to tell you: He is a fine, fine person. During a television interview with Fox News before taking the stage, Trump questioned the timing of the allegation. Why didn’t someone call the FBI 36 years ago? he asked. Trump was in town to stump for Nevada Republican Dean Heller, who is facing a midterm challenge for a U.S. Senate seat by Democratic U.S. Rep. Jacky Rosen. 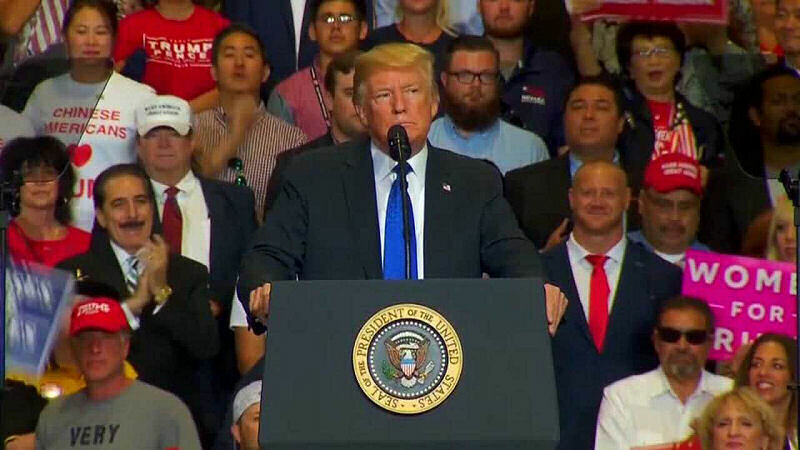 During his speech, Trump listed his accomplishments in office, including his tax cuts and immigration policies, while criticizing opposition from Democrats and the media. He also mocked former President Obama for campaigning for the Democrats running in the midterm elections. When I was running he campaigned harder than Hillary Clinton.